Home / Blog / Have You Thought About Cross-Browser Compatibility? How is your website rendered to users with different browsers and devices? Is it displaying correctly to visitors who use Chrome and Firefox? Is it working properly for Internet Explorer users? A website can be called cross-browser compatible when it manages to function as intended when viewed using latest major web browsers. A browser is an application for retrieving, presenting, and traversing information on the web. 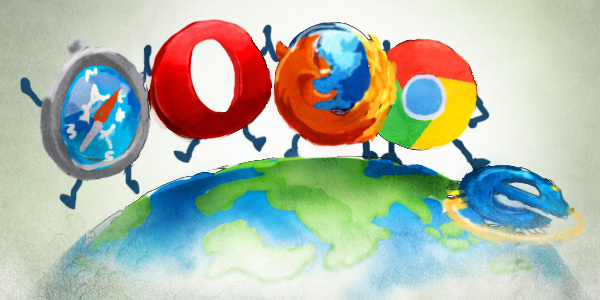 The major web browsers are Chrome, Firefox, Safari, Opera, and Internet Explorer. Each of them has different rendering methods, which causes your website to be shown slightly differently to visitors using different browsers. Cross-browser compatibility testing is one of the necessary steps in professional web development. It makes everybody be able to view your website perfectly regardless of which browser they are using. If your web layout is incorrectly displayed in one of the browsers, visitors who use that particular browser will not be able to enjoy the full experience of your website. So does that mean a website is automatically not cross-browser friendly if it does not support all browsers? Not always. In some cases, it may be necessary to drop support for outdated browsers. Certain primitive browsers (such as the older version of Internet Explorer) are known for their inability to support some of the newer web technologies (namely as HTML5 and CSS3). In cases when such technologies are necessary, web designers will have to make a decision whether the benefits from implementing new technology outweigh the cost of dropping support for older browsers. Take a look at your current website analytics to determine how many of your visitors are actually using outdated browsers. If the number are not significant enough, it may pay off more to implement new technologies and appear cutting-edge to most, rather than to play it safe and appear average to all. The important thing is not to let outdated browsers stop your website from improving. Do you want to build a cross-browser compatible (and technologically up-to-date) website? Let us help!